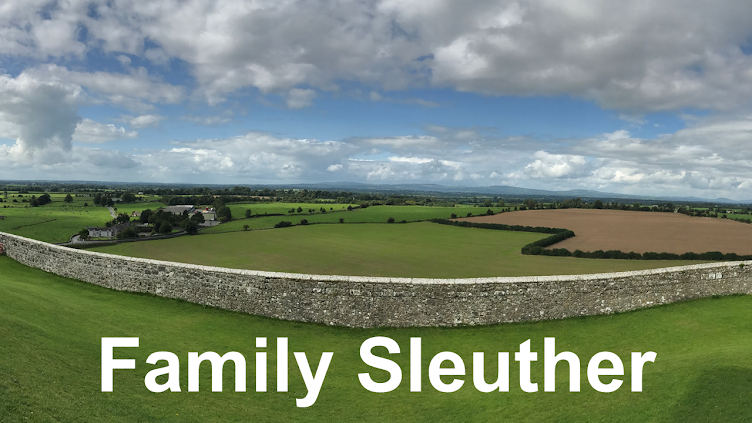 Family Sleuther: A Genealogical Land History: Location, Location, Location! 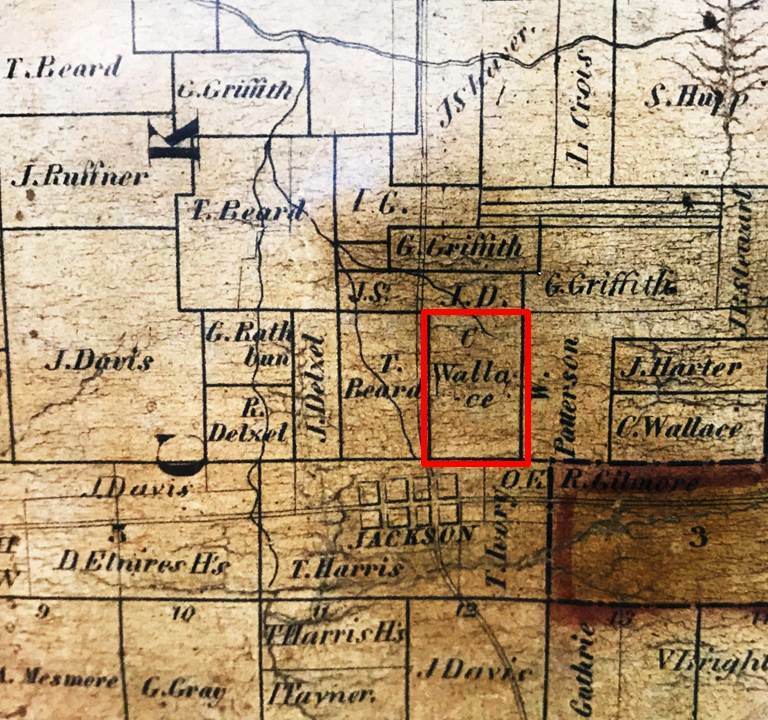 Licking Township, a small rural Ohio community located about 35 miles east of Columbus, was, for much of the early 19th century, the epicenter of my fifth great-grandfather Thomas Kirk's life. The jurisdiction is one of 25 townships that make up Licking County today, but in 1805 when Thomas first arrived in the Ohio wilderness it was part of Fairfield County, which had expansive borders across the center of the Buckeye State. "When...the earliest settlers occupied Licking valley they must have been surprised at the variety and beauty of its vegetable productions. The silence of the primeval woods had until then been unbroken; the forest was here in all its native majesty and beauty; the gigantic size and venerable antiquity of the trees, the rankness of the weeds, grasses and trailing vines which formed a thick covering for the ground, the luxuriance and variety of the underbrush, the long vines that reached to the tops of the tallest trees, the parasites that hung in clusters from the loftiest bough, the brillancy of the autumnal foliage, the splendor and variety of the vernal flowers, the snowy whiteness of the dogwood blossoms of early spring and the exuberance of the fruits that were maturing during the summer and autumn, were undoubted manifestations of the most vigorous vegetable life, and an encouraging proof of the quality of the soil." 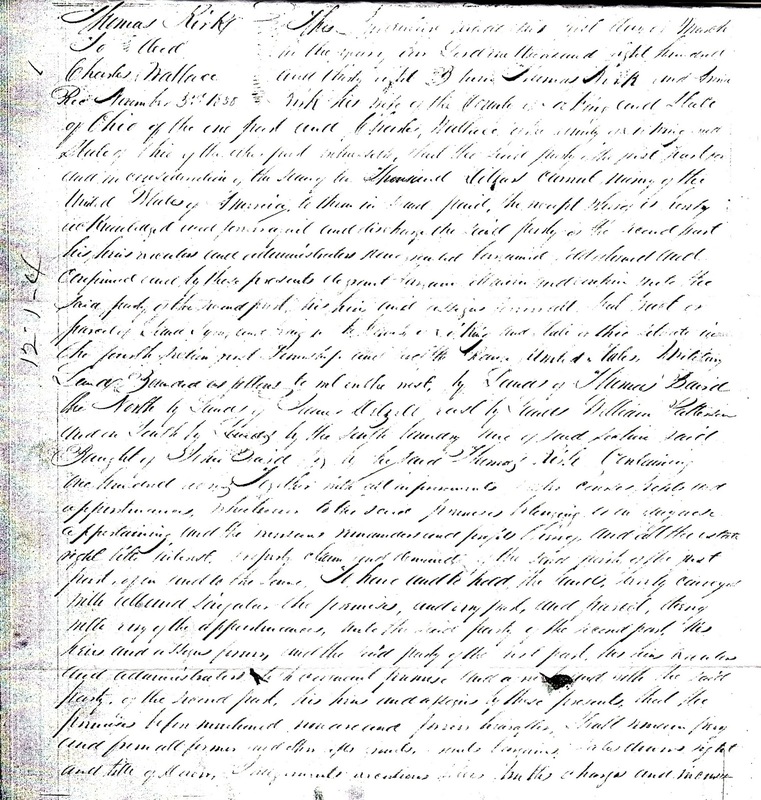 As early as 1806, Thomas Kirk paid a 65 cent land tax for 100 acres located in Range 12, Township 1, Section 4. Township 1 was - and still is today - Licking Township. 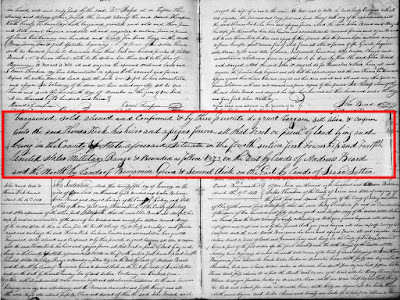 While the tax records place Thomas in Licking Township as early as 1805 (the year for which the 1806 list assessed tax liability), it wasn't until 1812 that he was on record purchasing the land. 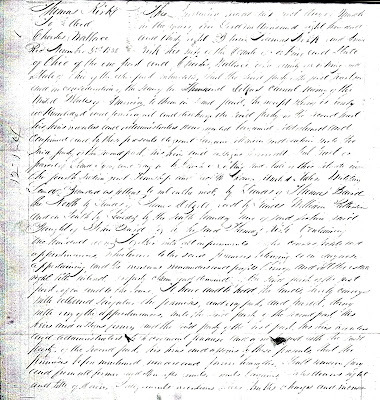 An indenture dated January 25, 1812, recorded Thomas purchasing 100 acres in Licking Township (now located in Licking County) from "John Beard and Margaret his wife." For the sum of $175 "current money of the United States," Thomas procured a tract of land "situated in the Fourth Section, First Township and Twelfth United States Military Range" (approximate GPS coordinates 39.960128, -82.411208). As fate would have it, Thomas' land purchase was ideally located and would prove to be a remarkable financial investment. In 1806, during the administration of President Thomas Jefferson, Congress authorized the construction of the first Federally-funded highway - the National Road. In 1815, after the end of the War of 1812, construction began in earnest and pushed the road (paved with compacted gravel) from Cumberland, Maryland to Wheeling, (West) Virginia and westward into central Ohio. The new thoroughfare lined the southern boundary of Thomas' 100 acres, bringing previously unparalleled movement of people and goods to his property's edge. From a series of vignettes recorded by Harper's Monthly in 1879, men who traveled the National Road during its heyday shared recollections illustrating what ran along Thomas' doorstep. "The wagons were so numerous that the leaders of one team had their noses in the trough at the end of the next wagon ahead and the coaches, drawn by four or six horses, dashed along at a speed of which a modern limited express might not feel ashamed. Besides the coaches and wagons, there were gentlemen travelling singly in the saddle, with all their luggage stuffed into their saddlebags. There were enormous droves of sheep and herds of cattle, which raised the dust like a cloud along their path. Once in a while, Mr. Clay or General Jackson made an appearance, and answered with stately cordiality the familiar greetings of the other passers-by. Homespun Davy Crockett sometimes stood in relief against the busy scene, and all the statesmen of the West and South Harrison, Houston, Taylor, Polk, and Allen among others came along the road to Washington." "The traffic was so heavy that generally it was safe from highway robbery, but the traveler by coach had his expedition spiced by the occasional assaults of highwaymen, who sprang out of the pines that in some places made perpetual night of the most brightest day. Nearly every mile had its tavern, and every tavern its pretty maid or jovial host. ‘The eating was the cream of the earth, Sir,’ said an old traveller to me. ‘I dined at Delmonico's (in New York) last week, and my dinner was nothing to the venison cutlets and the ham and eggs and johnny-cakes of the pike...'"
Tucked away on the shelves of the Licking County Genealogical Society's library is a self-published family history by Lua Beard Wallace. "Charles Wallace worked on the 'National Pike' from 1828 on to 1835 part time from before Wheeling to Springfield [Illinois]. He rode horse back with saddle bags and superintended the masonry all along and when pay day came he paid off the men working on the stone culverts, some of which are still standing and being used. Going back and forth so many trips between Wheeling and Columbus he thought this farm was the prettiest between these two places... He thought about these things for a long time... finally he bought this farm." 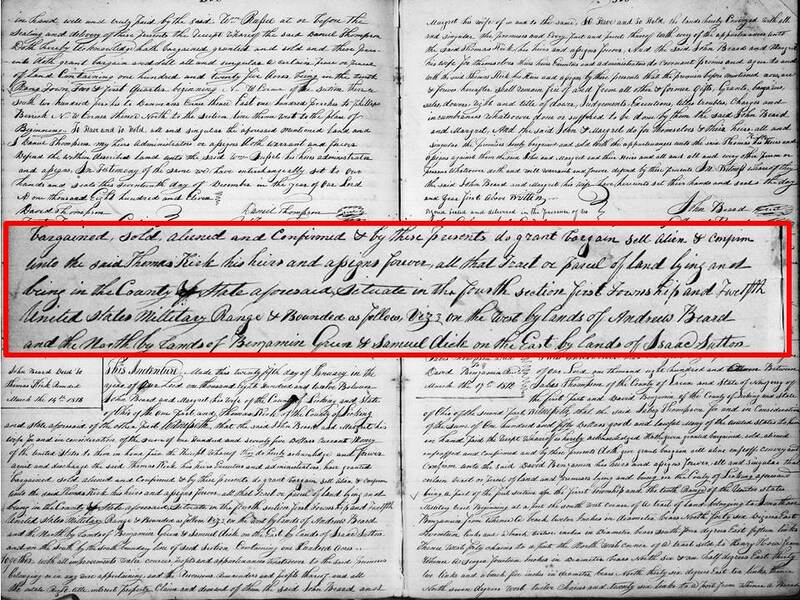 On March 1, 1838, Thomas Kirk made his second appearance in county land records. For $2,000, he sold his 100 acres in Licking Township to Charles Wallace. Although Charles owned several properties, perhaps Thomas' farm was the one that he thought was "the prettiest" between Columbus and Wheeling. The $2,000 sale price represented a whopping return on Thomas' initial $175 investment. Over the span of 26 years, the value of his 100 acres in Licking Township grew more than 1,000%. Perhaps the close proximity to the newly-built National Road propelled the property value skyward. In summer 2017, I visited Licking Township and gazed across Thomas' 100 acres. If you listen carefully, you can hear faint traffic noise as cars speed along Highway 40 - the modern name for the National Road. I love how you pieced this together. It helps to see yours before I do my own land post. Thank you, Cathy! I'm looking forward to your land record post. It'll be a while since I have 11 more children's census records to post before I get to the land records.